Good Morning, this is Capital Essence’s Market Outlook (the technical analysis of financial markets) for Thursday October 18, 2018. We’ve noted in the previous Market Outlook that: “so far the upswing that started off the October low of 2710 on the S&P has proved nothing as far as its staying power or as a possible major upswing. Resistance is strong between the 2823-2873 zone and upside momentum does not appear strong enough to generate a decisive breakout. With this in in mind, we would consider taking down exposure into additional strength.” As stocks sold off sharply Wednesday that saw the S&P dropped more than 1 percent at its low of the day before buyers stepped in and pushed the bench mark gauge off the intraday low. For the day, the S&P closed just below the flatline at 2,809.21. The Dow Jones Industrial Average fell 0.36 percent to 25,706.68. The Nasdaq Composite closed slightly lower at 7,642.70. The CBOE Volatility Index (VIX), widely considered the best gauge of fear in the market, fell more than 1 percent close at 17.40. One of the more noteworthy developments in recent days has been the move in the defensive-oriented health care sector. The group continues to outperform with a gain of 0.4% Wednesday. With today’s gains, the sector has nearly overtaken the information technology group as 2018’s top performer. The Health Care Select Sector SPDR ETF (XLV) is up 13.0 percent YTD, while the S&P is higher by 5.1%. Now the question is whether recent the rally has more legs? Below is an update look at a trade in XLV. Our “U.S. Market Trading Map” painted XLV bars in green (buy) – see area ‘A’ in the chart. 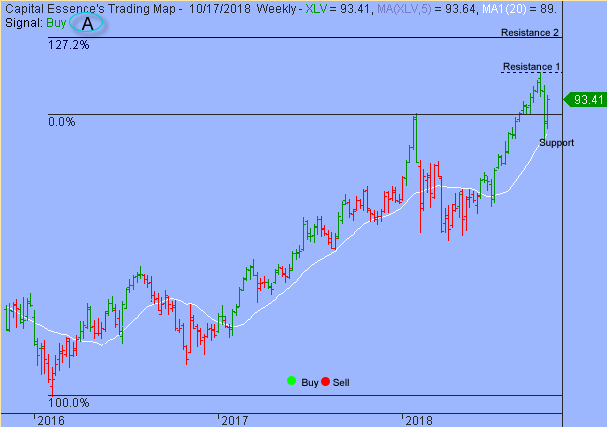 Over the past few weeks, XLV has been trending lower in a short-term corrective mode as it works off overbought conditions. The early October correction tested and respected support at the 20-week moving average, a key technical level. This week’s bullish reversal is a clear indication of demand overwhelming supply. This is a positive development, supporting further upside follow-through and a test of the more important resistance near 100. That level roughly corresponds with the 127.2% Fibonacci extension of the 2016 upswing. Short-term technical outlook remains bullish. Last changed October 16, 2018 from slightly bearish (see area ‘A’ in the chart). Key technical development in Wednesday’s trading session was a consecutive close above the important sentiment 2800 mark. The action is very encouraging though market internal does not appeared strong enough to generate widespread breakouts. Additionally, Money Flow measure still hovers near the lowest level since summer 2017, indicating a negative net demand for stocks. Near-term, as long as the S&P holds above the October 11 capitulation low of 2710, we’re intended to hang on to the bullish bias. Longer term, the uptrend that began in 2016 is still intact. 2700 is the line in the sand. A close below that level on a weekly basis will break the long-term uptrend and a retest of the early 2018 lows should be expected. Short-term trading range: 2767 to 2825. S&P has support near 2767. A close below that level has measured move to 2700. The index has resistance near 2825. A close above that level has measured move to 2873. 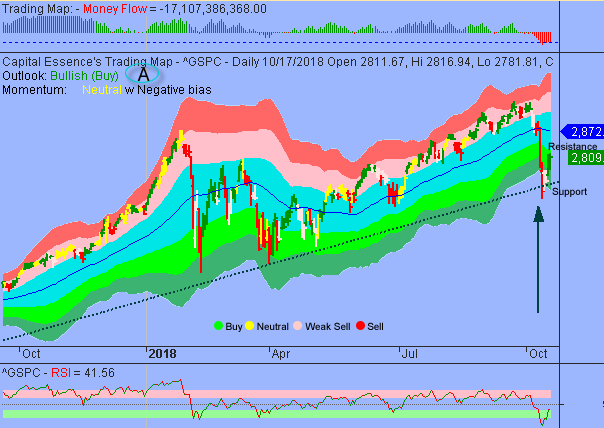 In summary, based upon recent trading action, the S&P could be in a process of establishing an important interim low where the next upswing will be based and launched. However, a close above the trend channel moving average is required before there is any real prospect of a change in the short-term downward trend pressure. As for strategy, traders should consider taking down exposure into additional strength.